The number of species of dragonflies and damselflies recorded in the Kruger National, South Africa, was 103 in April 2018. This figure was based on a database containing 2,817 records of Odonata, made since 1980, from the 52 quarter degree grid cells which intersect with the Kruger National Park. Records were available for 41 of the 52 grid cells. The most frequently recorded species were Red-veined Dropwing Trithemis arteriosa (167 records) and the Orange-veined Dropwing Trithemis kirbyi (144 records), both recorded in 33 grid cells, and Southern Banded Groundling Brachythemis leucosticta (175 records) and Broad Scarlet (141 records) both in 29 grid cells. Based on records up to April 2018, the median date of the most recent record for species was September 2017, so that half of the 103 species had been recorded during summer 2017/18. This report could be used to motivate the proclamation of the river and wetland systems of the Kruger National Park as a ‘Wetland of International Importance’ in terms of the Ramsar Convention. Two-thirds of the Odonata of South Africa, and one-eighth of the Odonata of Africa, have been recorded in the Kruger National Park. This document is experimental. It aims to provide a model for the presentation of biodiversity data that can be used by managers and policy makers, by researchers, and by citizen scientists. For these groups of people it aims (1) to provide a snapshot, at a point in time, of the quality and volume of data available for a locality, and (2) aims to provide links to the relevant databases, so they have access to useful summaries of the ongoing data collection effort. In this case the locality is the Kruger National Park, South Africa, and the component of biodiversity under consideration is the Odonata, the dragonflies and the damselflies. We are looking for suggestions that will improve the usefulness of this product. We are primarily hoping that this review will be on value to managers and policy makers, so it is their information needs which we primarily want to meet. The Kruger National Park (KNP) is the flagship national park of South Africa. The KNP, located in the north-eastern corner of South Africa, was established as a government reserve in 1898 and became South Africa’s first national park in 1926. It was first established to control over-hunting and to protect the dwindling number of herbivores in the Lowveld (Stevenson-Hamilton 1993). The KNP is currently nearly two million hectares in size (19,485 km2). It is a national conservation icon of South Africa and considered to be a safe haven for many fauna and flora. KNP is home to approximately 2,000 species of plant, 53 fish, 34 amphibians, 118 reptiles, 517 birds and 147 mammal species (SANParks 2016). KNP is about 360 km long from north to south, and about 65 km wide on average, from west to east. Its widest point is 90 km (Paynter & Nussey 1986). The park is bordered by the Limpopo River in the north and the Crocodile River in the south, forming natural park boundaries. Several other rivers run through the park from west to east, including the Sabie, Olifants, Letaba and Luvuvhu Rivers. The Lebombo Mountains lie on the eastern park boundary with Mozambique and to the west the KNP is fringed with many other private nature reserves (forming part of the Greater Kruger National Park) and local communities, villages and towns. The park’s altitude ranges from 200 m to 800 m. The highest point is Khandzalive Hill in the south-west of the park near the Berg-en-Dal rest camp (Paynter & Nussey 1986). The Lowveld, and consequently the KNP, has a subtropical climate. Subtropical climates are characterised by warm, humid summers and mild, dry winters. Summer temperatures can rise above 38 °C. The rainy season starts around November and lasts until May. The driest period is September and October (SANParks 2016). This document provides information related to the Odonata for the Kruger National Park as well as a selection of species distribution maps. It makes use of the open access database developed by a project funded by the JRS Biodiversity Foundation which generated the Odonata Database of Africa (Clausnitzer et al. 2012, Dijkstra 2016, available online as African Dragonflies and Damselflies Online at http://addo.adu.org.za) and the citizen science database generated by the OdonataMAP project (Underhill et al. 2016, available online at http://vmus.adu.org.za). Both databases are open access. This report is based on species recorded in 52 quarter degree grid cells which fall entirely or partly within the KNP (Table 1, Figure 2). Search queries made to the OdonataMAP database can be extended to include a search of the Odonata Database of Africa, which includes almost all of the museum specimen records for the region. This has been done for this report. Table 1. 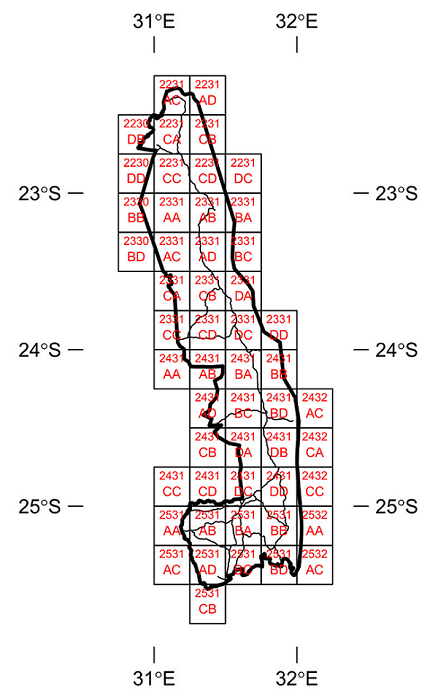 The codes for the Quarter Degree Grid Cells (QDGC) which fall fully or partly within the Kruger National Park (KNP). The column headed ‘% in KNP’ provides an estimate of the percentage of the QDGC which lies inside the KNP. Figure 2. Locations of the 52 Quarter Degree Grid Cells (QDGCs) which intersect with the Kruger National Park. These are listed in Table 1. The naming convention follows the tradition that has been used in South Africa for almost a century. There are 16 QDGCs in a one-degree grid cell. Each one-degree cell is numbered by the coordinates, latitude first, then longitude, of the northwest corner of the cell. The subdivisions of the one-degree grid cell have an alphabetic notation, as shown. On 23 April 2018, there were 2,817 records of Odonata in the combined database of OdonataMAP and the Odonata Data Base of Africa, recorded since 1980. Of these, 2663 had been identified to species level, and the remainder to genus level. The number of species recorded for the Kruger National Park was 103 species from eight families (Table 2). Within Table 2, the ordering is first alphabetically by family, and then by genus and species. Table 2. Species of Odonata recorded in the 52 quarter degree grid cells (Table 1) which intersect with the Kruger National Park, South Africa. The cut-off date is 1980; i.e. records prior to this are not included in this analysis. 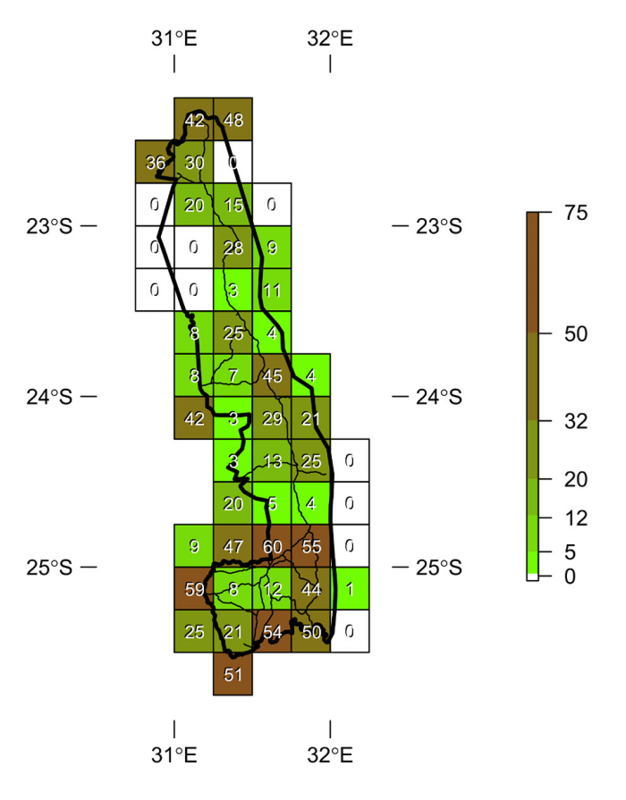 The number of quarter degree grid cells in which each species has been recorded is given, and n refers to the number of records in joint ADDO-OdonataMAP database for the species. The table lists 103 species. 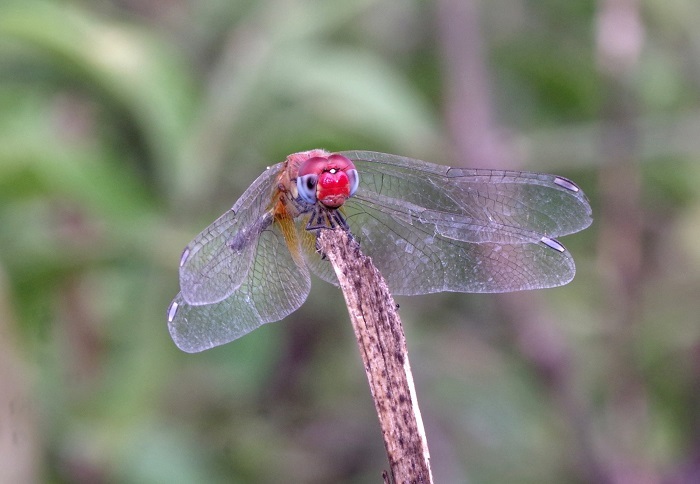 The Red-veined Dropwing Trithemis arteriosa (167 records) and the Orange-veined Dropwing Trithemis kirbyi (144 records) were both recorded in 33 of the quarter degree grid cells of the Kruger National Park, and Southern Banded Groundling Brachythemis leucosticta (175 records) and Broad Scarlet (141 records) in 29 grid cells (Table 2). These four dragonflies were the most widely distributed species. The dataset is commendably “young” (final column of Table 2). Based on records up to April 2018, the median date of the most recent record for species was September 2017. In other words, half of the 103 species had been recorded during the most recent eight-month period, i.e. in summer 2017/18. The lower quartile was in March 2015, indicating that three-quarters of the species have been recorded in the most recent three years. Special attention needs to be focused on “refreshing” the records of the species in oldest quartile; in this case, it is species not recorded since 2015. Of species recorded since 1980, nine have not been recorded for more than 10 years, i.e. prior to 2008 (Table 2). Common Thorntail Ceratogomphus pictus was last recorded on 12 December 2006, Two-striped Skimmer Orthetrum caffrum was last recorded on 27 January 2007, and Spectacled Skimmer Orthetrum icteromelas was last recorded on 7 March 2011 (Table 2). For a further six species, only the year of the last record is available: Pygmy Basker Aethriamanta rezia (1992), Steam Hawker Pinheyschna subpupillata and Little Wisp Agriocnemis exilis (2001), and Spotted Spreadwing Lestes tridens, Lined Claspertail Onychogomphus supinus and Little Duskhawker Gynacantha maderica (2002). Eight of these nine species have been recorded only once in the Kruger National Park since 1980, and the Spotted Spreadwing twice (Table 2). The presence of these species needs careful evaluation. Six species were last recorded in 2012, four in 2013, and 11 in 2014. Of the species in the “oldest” quartile, three had been recorded in more than 10 grid cells: Black Sprite Pseudagrion commoniae (18 grid cells, 43 records), Ringed Cascader Zygonyx torridus (16 grid cells, 24 records) and Ferruginous Glider Tramea limbata (10 grid cells, 13 records) (Table 2). The current status of these three species should be investigated. They were last recorded in 2014 (Table 2). The maximum number of species of Odonata in any of the 52 quarter degree grid cells of the Kruger National Park was 60 (Figure 3). The median was 12 species. Eleven grid cells had no records of Odonata. Most of these grid cells have only a small percentage of their area within the Kruger National Park, and those on the eastern edge of the park are mostly in Mozambique and are virtually inaccessible even from within that country (Peter Lawson pers. comm.). If these grid cells are excluded from the calculation, the median number of species per grid cell is 21. Figure 3. 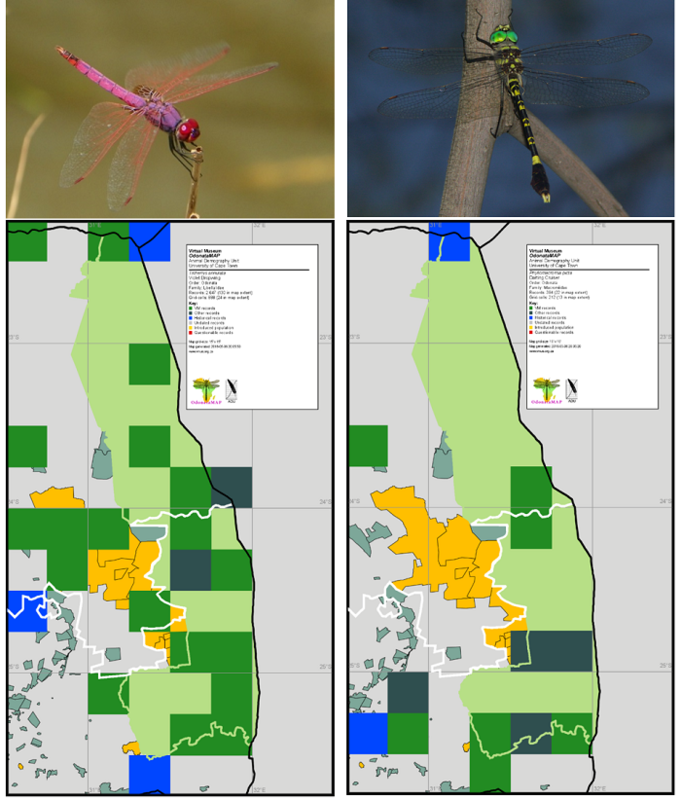 Species richness of the Odonata (dragonflies and damselflies) in the Quarter Degree Grid Cells (QDGC) which intersect with the Kruger National Park. Refer to Figure 2 and Table 1 for the naming conventions of each QDGC. Table 3. The number of species recorded in each of the 41 quarter degree grid cells intersecting with the Kruger National Park which have Odonata data. The quarter degree grid cell code is provided, the number of species recorded, and the number of records of these species. Because of the difficulty of making identifications of species with certainty from photographs, some records are identified to genus or family. The final column gives the total number of records for the grid cell in the database. What is immediately clear from Figure 3 is that the species richness within the park appears to be spatially uneven, with no strong geographical pattern (such as a decrease from north to south, or east to west). Figure 3 is the result of two confounded processes: the fieldwork behaviour of the observers (technically, the observer process) and the truth on the ground (the biological process). Although there is likely to be variation in the number of species per grid cell, due to the uneven distribution of suitable wetland habitat for Odonata, the true variation is unlikely to be as large as depicted in Figure 3. The challenge for fieldwork in the Kruger National Park is that the dragonflies and damselflies share their habitat with Nile Crocodiles Crocodylus niloticus, Common Hippopotamuses Hippopotamus amphibious and other life-threatening animals. As a result, and in accordance with the SANParks code of conduct for visitors to the Kruger National Park, most river systems and wetlands are out of bounds; this makes consistent recording of especially the damselflies difficult, and introduces a bias into the data. In spite of this, it is probably feasible, now that the unevenness of the observer effort is displayed (Figure 3), that the citizen scientists who are the primary contributors of data to OdonataMAP will find a way to reduce as much of the bias introduced by the observer process as feasible. Figure 4. 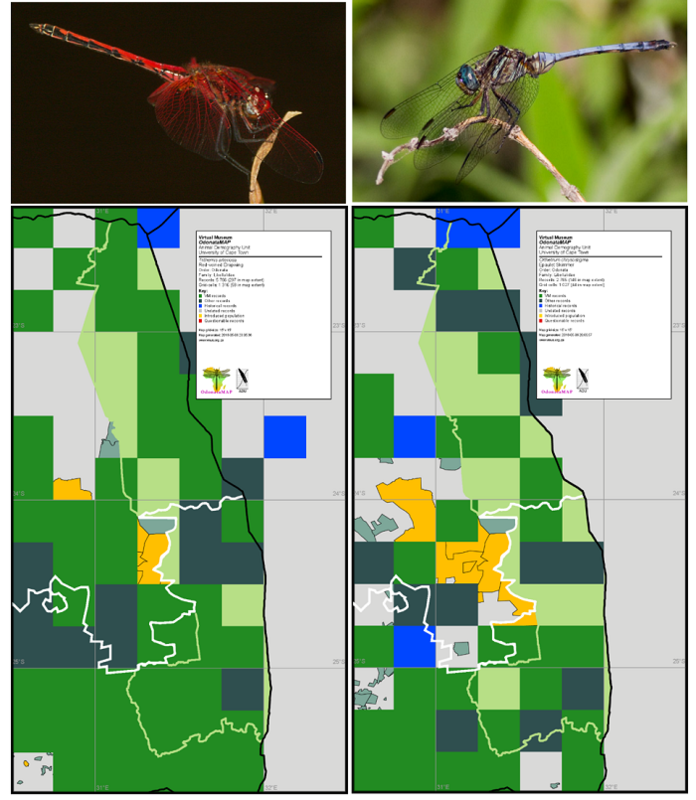 Distribution maps for the Red-veined Dropwing *Trithemis arteriosa* and the Epaulet Skimmer *Orthretrum chrysostigma* in the Kruger National Park and surrounding areas. The Red-veined Dropwing has been recorded in 33 of the 52 QDGCs which intersect with the Kruger National Park, the most widespread species, and the Epaulet Skimmer in 24. The distribution beyond the Kruger National Park is displayed on these maps. This gives the map for the species with species code number 668670, the Red-veined Dropwing (Figure 4). The species codes are provided in the first column of Table 2. Figure 5. Distribution maps for the Violet Dropwing *Trithemis annulata* and the Darting Cruiser *Phyllomacromia picta* in the Kruger National Park and surrounding areas. The Violet Dropwing has been recorded in 16 of the 52 QDGCs which intersect with the Kruger National Park and the Darting Cruiser in eight. The distribution beyond the Kruger National Park is displayed in these maps. These lists are constructed to the same format as that of Table 2, including the provision of the most recent record of each species in the grid cell. The list can be copied and pasted to Excel, where they can be sorted and manipulated as needed. These list include numbers of records for which the expert panel was unable to make an identification to “species” level. Three key papers have been written which focus on the Odonata of the Kruger National Park (Table 4). The first was a list of 21 species recorded by Balinsky (1965). Three decades late, Clark & Samways (1994) generated a list of 80 species, based on three sources: the 21 species by Balinsky (1965), their own list of 59 species from along the Sabie River, and a list of 61 species generated by “other collectors” in the period between Balinsky’s fieldwork and their own. Clark & Samways (1994) noted that there were three species which had only been recorded by Balinsky (1965); these are included in the list of Table 2; i.e. their presence has been confirmed. They also noted that there were 11 species which were only on the list made by “other collectors”. All except one of these species is included in Table 2; the exception is Cryptic Syphontail Neurogomphus vicinus, a species which has only been recorded from its type locality in the Democratic Republic of Congo (Schouteden 1934); so this species represents an error. Table 4. Papers which focus on reviews of the Odonata (dragonflies and damselflies) of the Kruger National Park. Clark TE, Samways MJ 1994. An inventory of the damselflies and dragonflies (Odonata) of the Kruger National Park, with three new South African records. African Entomology 2: 61-64 Using the list by Balinsky (1065) as baseline, made three decades previously, records made by other researchers, and their own data from a study of the Odonata along the Sabie River, the authors extended the list to 81. Clark TE, Samways MJ 1996. Dragonflies (Odonata) as indicators of biotope quality in the Kruger National Park, South Africa. Journal of Applied Ecology 33: 1001-1012 This paper demonstrated how the Odonata can be used to undertake biomonitoring of the Sabie River. Ten ‘biotopes’ (waterbody types) were identified, and the Odonata species characteristic of each were identified using multivariate statistical methods. It is remarkable how the list of Odonata species has grown in the past five decades, from 21 to 80 and currently 103 (Tables 2 and 4). It is even more remarkable that two-thirds of South Africa’s species of Odonata (Tarboton & Tarboton 2015) have been recorded in the quarter degree grid cells which intersect with the Kruger National Park. This paper has aimed to highlight the contents of the OdonataMAP database, in relation to the Kruger National Park, providing a snapshot from April-May 2018. But it also provides the tools to enable users (1) to obtain up-to-date species distribution maps for the dragonflies and damselflies of the Kruger National Park, and (2) to obtain up-to-date species lists on the scale of the quarter degree grid cell. These maps and lists are extracted “on the fly” from the live database for the project when the queries are made. These distribution maps and species lists can only be comprehensive if the OdonataMAP database contains the entire knowledge base. One of the concerns of the second decade of the 21st century is the proliferation of a variety of biodiversity data collection initiatives. This serves to split (and confuse) the citizen scientist community, which is in any event small, and to generate a diversity of databases which do not communicate with each other, and ultimately result in products such as those produced within this system being incomplete. The OdonataMAP database (supplemented by the Odonata Data Base of Africa (Clausnitzer et al. 2012, Dijkstra 2016) which contains the overwhelming majority of specimen records in museum collections, and the observations of taxon specialists), is currently the most reliable and up to date database of the Odonata in Africa, and growing rapidly (Underhill et al. 2016). We are seeking suggestions for additional resources which would be perceived valuable. For example, both managers and citizen scientists might be interested in a species map which shows the time elapsed, in appropriate units, since the species was recorded in each grid cell. From a management perspective, if a pattern emerges, it is a warning that a species is becoming hard to locate in an area, and that it might be going extinct there. From the citizen scientist perspective, this knowledge provides an incentive of which species need to be “refreshed” in each grid cell. Another example might be a table which shows the median date of the records from each quarter degree grid cell. From both management and citizen scientist perspective, this provides guidance as to where observer effort should be focused. How can these data be used for annual monitoring of Odonata in the Kruger National Park? Because the bulk of the records are made by citizen scientists it is difficult to impose a strict protocol on data collection. However, with some ingenuity, it ought to be feasible to encourage citizen scientists, cumulatively, to visit as many grid cells as they are able, and to use these data some form of occupancy modelling to estimate changes in distribution and seasonality through time. There is a natural annual pattern to the occurrence of adult dragonflies and damselflies, with a winter lull. This annual cycle can be used to plan citizen scientist data collection strategies for the upcoming summer. Given the hazards of doing fieldwork in the presence of dangerous wild animals (and in fact the understandable prohibition on this by SANParks for citizen scientists), it is not going to be feasible to undertake a complete survey of the distribution of dragonflies and damselflies of the Kruger National Park. It is therefore sensible to think in terms of using species distribution models to achieve this (Elith & Leathwick 2009, Franklin 2009, Guisan et al. 2013). Although in this paper, the data have been summarized in terms of quarter degree grid cells, the overwhelming majority of the individual records are georeferenced. This means that it is possible to use a species distribution model system such as MaxEnt to generate plausible distributions of species (Elith et al. 2011). Finally, this paper ends up effectively being a motivation for the proclamation of the Kruger National Park, or at least its river and wetland systems, as a “Wetland of International Importance” in terms of the Ramsar Convention (Ramsar Convention on Wetlands 2016). About two-thirds of the Odonata ever recorded in South Africa have been recorded here. About one-eighth of the Odonata of the continent of Africa have been recorded in the Kruger National Park. The primary acknowledgement needs to be attributed to the people who collected the data, both professional entomologists and citizen scientists. We acknowledge funding support from the JRS Biodiversity Foundation. Many people commented on earlier drafts. Balinsky BI 1965. A preliminary list of the dragonflies (Odonata) of the Kruger National Park. Koedoe 8: 95-96. Clark TE, Samways MJ 1994. An inventory of the damselflies and dragonflies (Odonata) of the Kruger National Park, with three new South African records. African Entomology 2: 61-64. Clark TE, Samways MJ 1996. Dragonflies (Odonata) as indicators of biotope quality in the Kruger National Park, South Africa. Journal of Applied Ecology 33: 1001-1012. Elith J, Leathwick JR 2009. Species distribution models: ecological explanation and prediction across space and time. Annual Review of Ecology, Evolution and Systematics 40: 677-697. Elith J, Phillips SJ, Hastie T, Dud KM, Chee YE, Yates CJ 2011. A statistical explanation of MaxEnt for ecologists. Diversity and Distributions 17: 43-57. Franklin J 2009. Mapping Species Distributions: Spatial Inference and Prediction. Cambridge University Press, Cambridge, UK. Guisan A, Tingley R, Baumgartner JB, Naujokaitis-Lewis I, Sutcliffe PR, Tulloch AIT, Regan TJ, Brotons L, McDonald-Madden E, Mantyka-Pringle C, Martin TG, Rhodes JR, Maggini R, Setterfield SA, Elith J, Schwartz MW, Wintle BA, Broennimann O, Austin M, Ferrier S, Kearney MR, Possingham HP, Buckley, YM 2013. Predicting species distributions for conservation decisions. Ecological Letters 16:1424-1435. Paynter D, Nussey W 1986. Die Krugerwildtuin in Woord en Beeld. Macmillan Suid-Afrika, Johannesburg. Ramsar Convention on Wetlands 2016. An Introduction to the Ramsar Convention on Wetlands. Ramsar Convention Secretariat, Gland, Switzerland. SANParks 2016. South African National Parks. Kruger National Park: Introduction. Retrieved from https://www.sanparks.org/parks/kruger/ on 5 October 2016. Schouteden H 1934. Les Odonata des Congo Belge. Annales Musée Congo Belge. Zoologie Serie 3 Section 2. Catalogue Raisonnés de la Fauna Entomolgique du Congo Belge Tome 3, Fascicule 1: 1-84. Stevenson-Hamilton J 1993. South African Eden: The Kruger National Park 1902-1946. Struik Publishers, Cape Town. Elith J, Leathwick JR 2009a. Species distribution models: ecological explanation and prediction across space and time. Annual Review of Ecology, Evolution and Systematics 40: 677-697. What’s the value of a photo?